mmm...the best of both worlds! Oh man, my two favorite pies in one delectable combination. Wish I'd known about this years ago: could have saved time and calories. This looks so good! 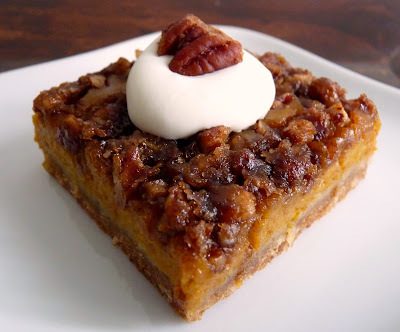 I love how you incorporated both pumpkin and pecan. I need this now. It looks like my absolute ideal dessert. This looks SOOOOOO delicious...I am a huge fan of pecans on my pumpkin pie, but these bars look even better. I am definitely making this next week! Thanks for another fabulous recipe and photos! Nicole, so pleased you enjoyed them. It's hard not to like such classic ingredients assembled in this way. Enjoy! Would love a piece of this right now. What an exceptional recipe to celebrate the bounty of autumn. 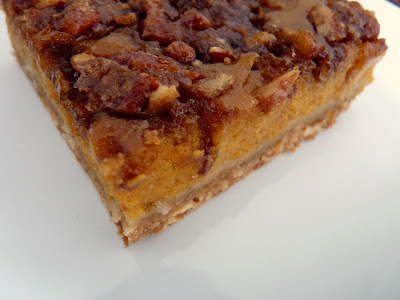 My family finds pumpkin pie boring, these bars are sure to delight them! Just checking back in to let you know that I made these for the holiday (substituted a more traditional crust for my rigid eaters ;-) and they were delicious! This is definitely a recipe I will make again. The sweet crunch of the topping contrasted beautifully with the smooth creaminess of the pumpkin. Delicious! Thank you for a new favorite recipe! Hey, Luv'n Spoonfuls, thanks so much for the great feedback. My friends gobbled this down, too. 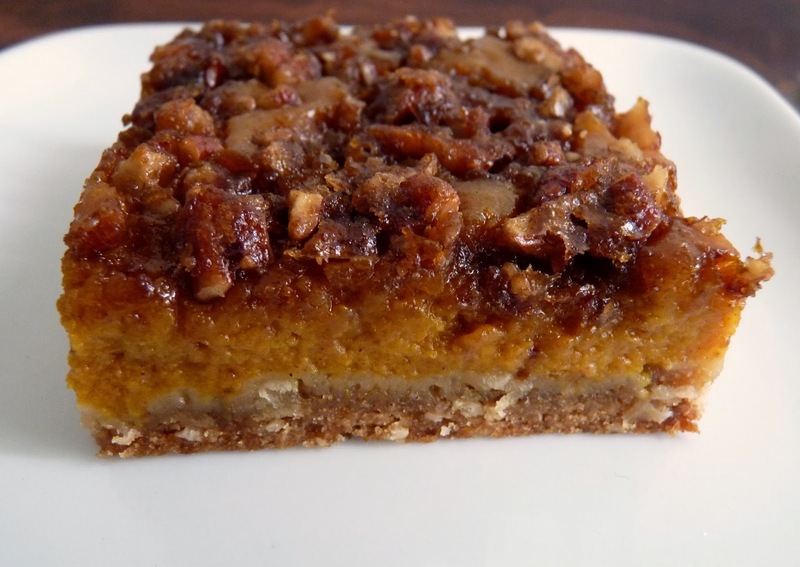 I love how the topping and pumpkin co-exist in perfect Thanksgiving harmony! Would the same amount of ingredients fill a 9" Tart Pan with removable pleated edge? Would you bake for the same amount of time? Looks to be a winning recipe. Thanks for sharing. Could I use the same recipe to fill a 9" removable bottom Tart Pan? So want to make this. Thanks. Believe it or not, an 8" square pan has a couple more cups of volume 9" tart pan. So I'm wondering if this would work since anyway it's not a very pastry. And you'd also want to probably run the crust up the sides of the tart pan for easy removal. I think, essentially, it should work.... You may have a bit extra filling but I would try it! If you do, please let me know how it works out. I apologize for the two post question. I guess I didn't see it go through the first time. Thanks for your very speedy answer...so appreciated. Actually I also have a 10 inch tart pan so I might just try it in that instead. I'll get back to you with the results. Again, thanks. I meant to say, it's not a very tall pastry. I made this for thanksgiving and everyone raved about it! I even got a marriage proposal from one of the guests after he tried it! I am so thankful for your blog. you are really the best. i come back to your blog for special occasions, holidays, and just when i want to make something really spectacular. i hope you had a beautiful thanksgiving. WHOA, WOW, not wait a minute: where's MY marriage proposal??!! Hahahahaha. Thanks so much for your really wonderful feedback. It really fills my heart with glee and appreciation for all my incredible readers and pastry warriors. I also love this dessert and am so very pleased your guests loved it, too. It's simple but really, really hits the spot. I hope you continue to find joy and l pleasure in these pages. And may you have the happiest of holidays and a blessed new year! !